ABOVE: Silversea's Silver Whisper at the San Basilio pier. On foot. From the San Basilio terminal, cross the small footbridge. You'll then be standing at the foot of the Zattere, a broad promenade that runs all the way from San Basilio to the historic Dogana customs house, which offers views of the Grand Canal, St. Mark's Basin, and the Doge's Palace on the San Marco waterfront. If you turn left and walk inland, you'll soon reach the Campo Santa Margherita (one of Venice's larger and livelier neighborhood squares). Follow the signs for Accademia and San Marco. Water taxi. A taxi acqueo is worth considering if you're staying at a hotel near the Piazza San Marco or another location far from the San Basilio pier. Expect to pay at least €45, and possibly more, for the trip. Read our Venice Water Taxis article and the warning about water taxis in our Venice Travel Blog before phoning for an aquatic cab. Note: If you're staying in Mestre, on the mainland, you can hire a land taxi for €40 or possibly a bit less, depending on traffic and your hotel's location. 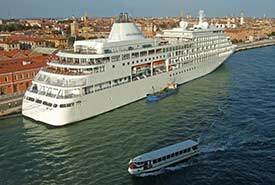 See our Venice Travel Blog post on Mestre for cruise passengers. Cruise transfers. Chances are, your cruise line will sell transfers by chartered coach from the pier to Marco Polo Airport. We recommend splurging on the cruise line's transfer unless you have at least five hours between the ship's arrival and your flight. Alilaguna boat. The "Blue Line" airport boat stops at the Molino Stucky Hilton on its way to Marco Polo Airport. (The hotel is directly across the Giudecca Canal from the San Basilio vaporetto stop.) Boats leave at 30-minute intervals, travel time is 1 hour 38 minutes, and tickets are fairly reasonable in price. Tip: If you don't mind walking about halfway up the Zattere from the San Basilio pier, you can catch a free shuttle boat to the Molino Stucky Hilton from the ACTV's Zattere boat landing (shown in the inset photo). This will save you a hefty vaporetto fare. Land taxi. You can catch a taxi from behind the San Basilio terminal, although you'll be competing with other passengers for the few available cabs. Travel time to the airport is 20 to 30 minutes, and the fare shouldn't exceed €45. If no cabs are available, telephone the Artisan Cooperative Radiotaxi. Private car. A number of limousine services will arrange to have a car and driver meet you at the pier and transport you to Venice Marco Polo Airport or Treviso Airport for a flat fee. We can't recommend any vendors ourselves, since we haven't used such services, but you can search Google for "venice airport transfers" or try a booking site like Shuttledirect or Airport Transfers Direct. Water taxi.A private water taxi is expensive (€120 or more), but it's a fun way to get from the cruise terminal to the airport. See our Venice Water Taxis article for more details, and read our warning about water taxis if you aren't physically fit or able to lift your luggage into a boat. To reach the Venezia Santa Lucia station, hire a taxi or take the No. 2 vaporetto (see above). To reach the Venezia Mestre station, hire a taxi or take the No. 2 vaporetto to Santa Lucia Station and buy an inexpensive commuter ticket to Mestre at one of the ticket machines. Remember to validate your ticket in a yellow stamping machine before boarding the train. The Hotels near San Basilio page in our Venice Cruise Terminal Hotels article recommends places to stay that are within walking distance of the pier.